Getting up at 5 a.m. for the gym rarely has its immediate rewards, but on Monday as I was flipping through the channels of hideous morning TV, I caught an episode of the Golden Girls. If there is one thing you haven’t learned from my blog of reflections and rambles… It might be my love for these ladies. The death of each Golden “Girl” felt personal, for example. I grew up watching them, but I also own every season (along with the Lifetime Intimate Portrait of each actress). It sounds like I’m bragging. Kind of. Anyhow, it was the episode where Blanche began being friendly with Dorothy’s ex, Stan, and in turn, she and Dorothy had a bit of a blowout. 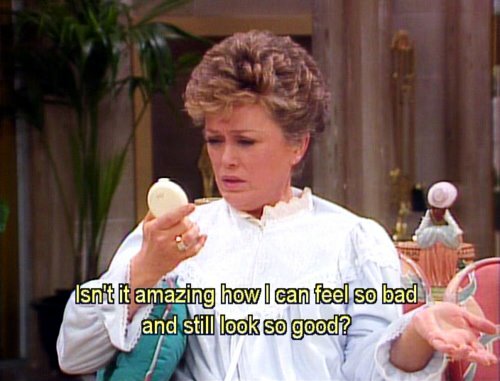 At the end, the two made up in their cheesy sitcom way, but then Blanche said something pretty spot on. I’m always using colors to describe how I’m feeling. Not sure if it’s a painter thing or just the inability to give words to emotions. I suppose today I’m feeling “magenta.” But not so much in a bad way as a confused way. A little hot, a little loud, a little chaotic. I don’t know. What color are you feeling today? Do you ever feel magenta? Just wondering if I’m the only goofball (along with Blanche) that puts colors to feelings.